All right rookies… this is no drill! 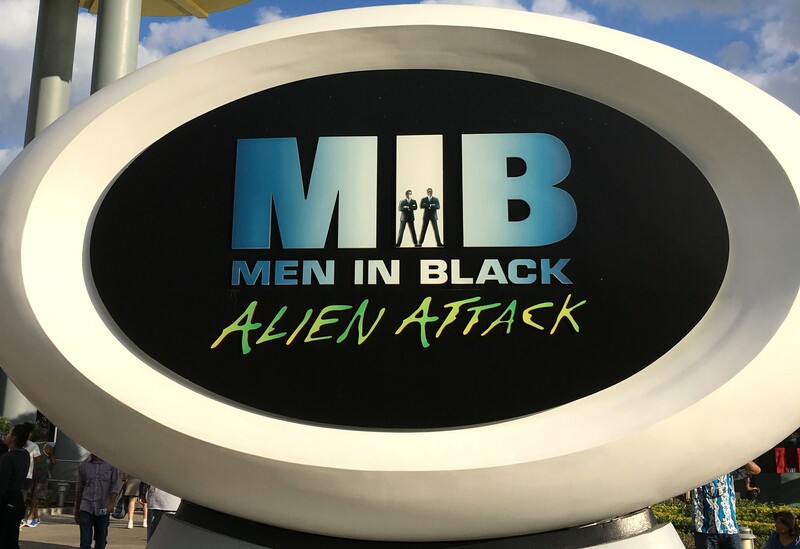 It's up to YOU to protect the Earth from aliens in MEN IN BLACK Alien Attack. As an agent trainee, you'll zap aliens as you chase them through the streets of New York in this high-tech, interactive ride based on the hit movies. But be warned... these aliens zap back, spinning your vehicle out of control. Wind your way through Men In Black's top secret underground headquarters, including the break room, the control center, the agents' locker area and weapons armory. Then board your training vehicle and ride through the streets, taking aim at "the scum of the universe" who have escaped from their intergalactic prison transport. The ride's outcome is based on your score – save Earth and you might get promoted to full-fledged Men in Black agent. With multiple endings, it's never the same ride twice! Have you got what it takes to join the best of the best? MEN IN BLACK Alien Attack is located in the World Expo area of Universal Studios within the 1964 World's Fair exhibit "The Universe and You." World Expo, looking like the setting for an international exposition, is a blend of the futuristic and the retro. Tips for Getting the Highest Score: The higher up the aliens are that you hit, the more points you will earn. You can hit the same aliens more than once to keep firing if it's working! Always hold down the trigger with your finger, it has automatic rapid fire and you're not penalized for missed shots. Look for hidden eyes in walls, windows, parking meters and posters as they're often overlooked by other riders. Immigration Tour: If it's not busy, you can ask a ride attendant for the free "Immigration Tour." If they have someone available they will take you to the floor of the large Immigration Room in the queue area, where you can take photos at an agent's desk and the animatronic alien twins. 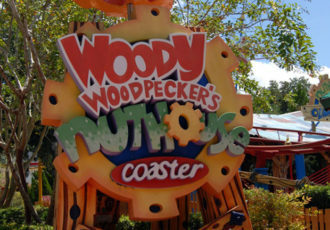 Dark places, scary aliens, and some ride vehicle spinning might not be appropriate for all young riders. It is a family ride, but ride at your own discretion. You can see an alien holding a Steven Spielberg mask on a stick sitting on a park bench reading a newspaper. 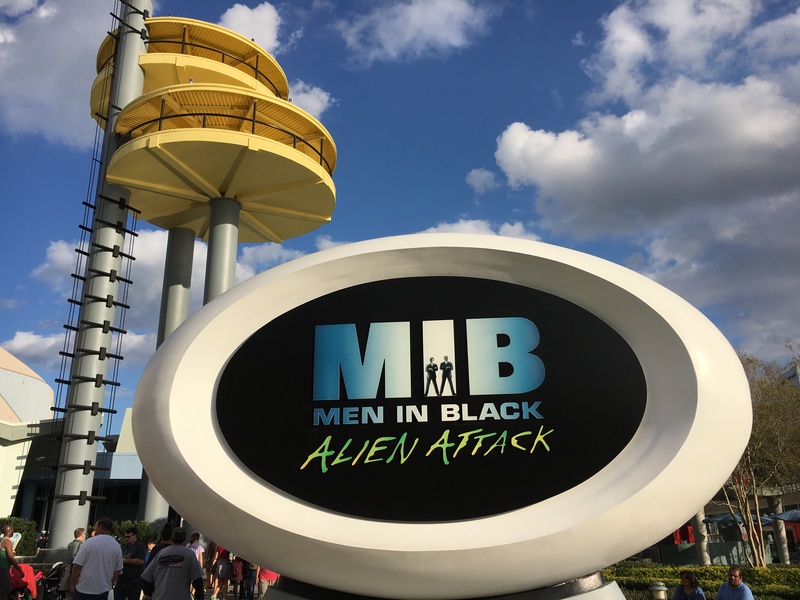 Spielberg is the executive producer for Men In Black and the ride designers honored him by placing him in the ride... and if you shoot him he's worth a lot of points!